Bandra (Marathi: वांद्रे Vandre), is a suburb located in the north-west of Mumbai, India. It has earned the sobriquet "Queen Of The Suburbs". The Bandra railway station is located on the Western line of the Mumbai Suburban Railway. Bandra is a highly coveted location for restaurants, pubs, and high-street stores. It has several restaurants and shopping areas. The population of Bandra is cosmopolitan in nature. It consists of a fair amount of Hindus, Christians (Catholics and others), Parsis (Zoroastrians), and Muslims. Bandra is home to numerous churches, including Mount Mary's Basilica. The Parsi fire-temple, Tata Agiary is located on Hill Road. Other famous religious places include the Jama Masjid (mosque) located near Bandra West railway station and the temple of Goddess Jari-Mari, located on S.V Road. A municipal lake, Swami Vivekanand Talao, is located in Bandra. It was closed to the general public in the mid 1990s. Juhu is a suburban neighbourhood of North Mumbai. 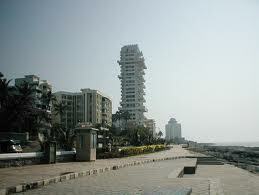 It is famous for its sprawling beach Juhu Beach. It is surrounded by Arabian Sea in the west,Versova in the North, Santacruz and Vile Parle in the east and Khar to the South. Juhu is one of the most affluent areas of Mumbai and many Bollywood celebrities live here too. Jogeshwari (Marathi: जोगेश्वरी) is a Western suburb of Mumbai, situated immediately to the north of Andheri. It is notable for caves dedicated to the Goddess Jogeshwari, who gives the suburb its name. We serve approximately 500 students across this cluster! Haideri School is our newest addition to this cluster. It’s a Muslim dominated community, with some Hindu population. The school is situated amidst the busy market area and the chawls. Parents of most students are auto drivers, tailors, jhari workers, carpenters etc. Jogeshwari is the place where the communal riots in 1992 were rampant. However, now it is a calmer place, but lot of families are backward and uneducated. Around the school, in the vicinity, there are a few low-middle income private schools and one college. Being very close to the station and the market, the community is hardly quiet.